We at your favorite Maryland Ford Dealer (well we think we are your favorite and if not then we should be!) have always thought the phrase “There’s an app for that” didn’t apply to EVERYTHING. Well apparently we were wrong. We stumbled upon this little article about a new app to help save fuel. How sweet is that! Imagine the fuel savings you could get if you use this with the all new Ford Fiesta. When the discussion turns to apps for the iPhone, it’s far easier to think of things that the iPhone can do than it is to come up with a list of stuff that itcan’t. DriveGain has introduced a new iPhone app that promises to save drivers up to $205 a year in fuel costs by following some simple visual and spoken cues. The DriveGain app uses the iPhone’s built-in GPS system to calculate the vehicle’s speed and rate of acceleration and deceleration. The visual displays include a recommended gear indicator and some sliders that drivers try to keep in the green. 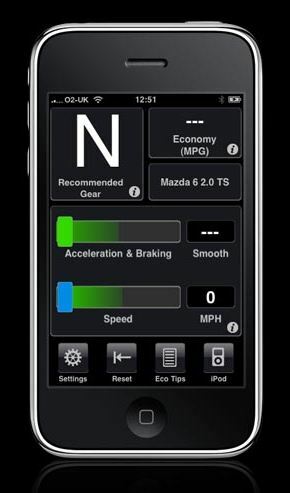 In addition, the app calculates fuel consumption, CO2 emissions, fuel cost per mile and much more. By following the on-screen cues, DriveGain claims that it can help users save hundreds in fuel while reducing CO2 emissions by up to 660 kilograms per year. The DriveGain app is currently only available for manual transmission vehicles, but automatics will be supported soon. The apps database has over 16,900 different cars to choose from and can be used on the iPhone 3G and 3GS, as well as on the iPod Touch and iPad. iPhone 4 support is coming soon. To download the app click here.